When you talk to a bankruptcy attorney in NJ he will explain how filing a Chapter 7 bankruptcy is a process of federal law that allows for individuals or businesses to make a fresh start. Chapter 7 will eliminate most of an individual’s unsecured debt and is usually the suggested type of bankruptcy for a person who has no assets, or at least very few of them. In most cases the unsecured debts that are released through a Chapter 7 bankruptcy include things like personal loans, credit cards, deficiencies on repossessed vehicles, medical bills or judgments that are the result of a car accident. Since the Chapter 7 filing procedure is complicated it will require the help of a bankruptcy attorney in NJ to help guide you through the process. 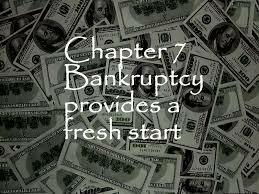 One of the biggest benefits that one will realize from filing a Chapter 7 bankruptcy is that they get a fresh start. The bankruptcy will discharge the debts that are owed and the ones that the debtor wants to maintain will be included on the signed “Reaffirmation Agreement.” One thing an individual will enjoy upon filing for Chapter 7 is relief from debt collectors. Creditors are not allowed to contact the debtor once the procedure has begun. The debtor is also protected from wage garnishments during this time. Another benefit of this type of bankruptcy which offers a fresh start is that any wages earned or property acquired after the bankruptcy is exempt and will not be subject to the creditors, the bank or the bankruptcy courts. If someone is in over their head they can file for a Chapter 7 since there is not a minimum amount of debt that they must have in order to file. It is also one of the fastest and least expensive ways for an individual to discharge debts. Even though there can be higher interest rates attached, an individual should be able to reestablish their credit in a very short time following a Chapter 7. It should not take too long to qualify for a new home, car or credit cards once the bankruptcy has been filed. What property will I get to keep? As long as the payments on a mortgage or vehicle are current and there is not a significant amount of equity in the property most people can keep both of them. There will need to be arrangements made concerning the payment schedules and they will have to be kept up to date. As a general rule most people find that they can keep their home, car, and all of their personal belongings and still be able to eliminate their debts. What happens with non-exempt properties? When an individual files a Chapter 7, the US Trustee’s Office will appoint an interim Trustee to the case. They will be responsible for liquidating any assets that the individual may have. If there are any assets they will be collected and sold to diminish the debts. The main role of a trustee is to liquidate the nonexempt assets in a way that will maximize returns to the unsecured creditors. However, if there are no assets they will file a “no asset” report in court and this will eliminate the distribution to unsecured creditors. If the case does seem to be an asset case at its beginning the Trustee has to send out a proof of claim to every creditor associated with the case. The creditors will then have 90 days to file a claim. Governmental departments such as theIRSor the Labor Department will have 180 days to file a proof claim.